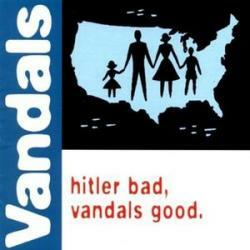 The Vandals is a punk rock band from the United States established in 1980 in Huntington Beach, California. They have released ten full-length studio albums and two live albums and have toured the world extensively, including performances on the Vans Warped Tour. They are well known for their use of humor, preferring to use their music as a vehicle for entertainment and sarcasm rather than as a platform for more serious issues.As of 2000, they have been signed to Kung Fu Records. The band's lineup fluctuated significantly over their first nine years, though founding members Steven Ronald Jensen, guitarist Jan Nils Ackermann, and first consistent drummer Joe Escalante remained regular fixtures. Of the early members only Escalante has remained through all subsequent incarnations of the band. The current lineup of Escalante, Dave Quackenbush, Warren Fitzgerald, and Josh Freese has remained intact since 1990 and is generally considered far removed from the band's early 1980s incarnation. Since 2002 Escalante has released all of the band's albums through his Kung Fu Records label, with Fitzgerald generally producing.